Once you experience breathtaking mountain views and perfect seasonal weather, you’ll see why Morganton, NC has been dubbed “Nature’s Playground” and why western NC has been called one of the “best places to retire.” Our ideal North Carolina location places us approximately one hour’s drive from Boone, Asheville, Statesville and Charlotte. With plenty of sightseeing, outdoor recreation, art and cultural opportunities, shopping and dining right here in Burke County, it’s no wonder so many of our residents and family members consider Grace Ridge a truly Good Mood retirement destination. By the time you reach Grace Ridge, you’ll know why our residents proudly call it home. Ride a steam engine or feed wildlife at Grandfather Mountain. Cool off at High Shoals Falls in South Mountains State Park or find a hot buy at Hickory Furniture Mart. 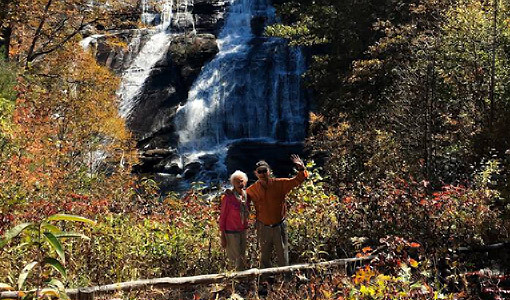 From breathtaking overlooks of the Appalachian foothills to storied forests and iconic drives like the Blue Ridge Parkway, retirement in Western NC makes any day a vacation. Morganton, NC offers many opportunities to step outdoors for fresh air and invigorating activities. From greenways and walkable trails with waterfall views to crystal clear lakes and majestic mountains, there’s something for everybody to do outdoors. Grace Ridge residents also enjoy membership to Morganton’s own Mimosa Hills Golf & Country Club, offering rounds of golf, tennis matches and dining with friends. 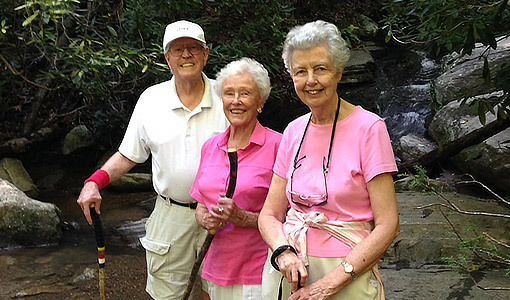 Our western North Carolina haven is ideal for active, thriving retirement living. For seniors seeking a retirement lifestyle filled with art and culture, downtown Morganton is the place to be. From wineries and breweries to art galleries, artisanal crafts and concerts, you’re sure to enjoy everything our historic western NC haven has to offer. Unique restaurants featuring delicious and creative dishes prepared by renowned chefs are at the heart of Morganton’s dining scene. There are gourmet and casual dining options throughout the area for all palates, which you’re sure to enjoy after an afternoon of shopping at Morganton’s many boutiques, galleries, antique shops or outlet malls.